The Street Rods are Coming! The York Expo Center, hosts Street Rod Nationals East, the largest annual street rod event in the Eastern US. 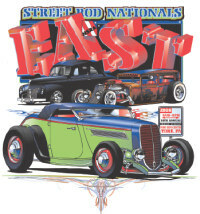 The event brings thousands of street rods into the city for a few days in June. On Friday afternoon the city holds a parade through the center of the city for participating vehicles. In the evenings you can visit all the local hotels and see the cars displayed, also some of the hotels have outside food vendors and music while all their guest show off there cars relaxing for the next day at the York Expo Center. It could be a great way to experience the car show without the expensive and heat at the fairgrounds. So if your driving through york June 5-7 and wonder why people have lawn chairs all along Rt. 30 you can be sure the Street Rods are in town.